The Hawker Hurricane is a British single-seat fighter aircraft of the 1930s-1940s that was designed and predominantly built by Hawker Aircraft Ltd for the Royal Air Force (RAF). 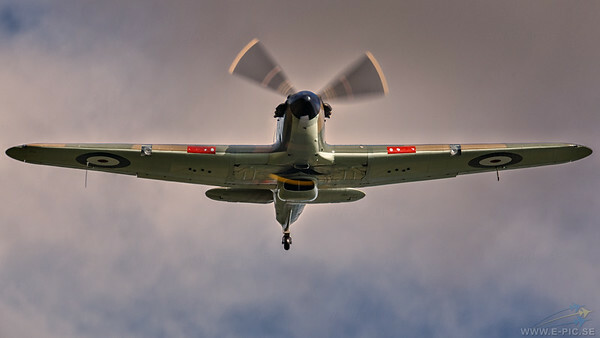 Although overshadowed by the Supermarine Spitfire, the aircraft became renowned during the Battle of Britain, accounting for 60% of the RAF's air victories in the battle, and served in all the major theatres of the Second World War. The 1930s design evolved through several versions and adaptations, resulting in a series of aircraft which acted as fighters, bomber-interceptors, fighter-bombers (also called "Hurribombers") and ground support aircraft. Further versions known as the Sea Hurricane had modifications which enabled operation from ships. Some were converted as catapult-launched convoy escorts, known as "Hurricats". More than 14,583 Hurricanes were built by the end of 1944 (including at least 800 converted to Sea Hurricanes and some 1,400 built in Canada by Canadian Car and Foundry). This example of the Hawker Hunter was built by Canadian Car and Foundry as a Hurricane I, with the serial AE977, in the spring of 1941. It went first to the RAF, then the Fleet Air Arm of the Royal Navy, for whose use it was converted into a navalised Sea Hurricane X. While based at Yeovilton it was involved in a mid-air collision during December 1942; the aircraft was written off. It spent many years in storage, before its purchase first by well-known warbird recovery specialist Jim Pearce, and then New Zealand collector Sir Tim Wallis and Tony Ditheridge of Hawker Restorations, who embarked on its rebuild in 1994. A first flight was made on 7 June 2000, the aircraft then painted as Douglas Bader's No 242 Squadron mount from 1940. AE977 went Stateside in 2001, joining the Friedkin family collection at Chino, California. During 2012 it was shipped back to the UK, and since then it has been based at the Biggin Hill Heritage Hangar. Its colours are now those of P2921, a No 32 Squadron Hurricane based at Biggin Hill in 1940 and flown by then Flt Lt Pete Brothers.